while the Escape is an excellent family carrier with great seating capacity and convenient cargo solutions, one shouldn't forget about its exceptional performance, impressive MPG and light off-roading abilities. If you've been living in Phoenix for years and haven't taken a trip to the Grand Canyon or even to nearby Sedona, the all-new 2013 Escape at Peoria Ford will get you to these destinations and back without breaking a sweat. The Escape's comfortable interior has plenty of seat and leg room, even for your older children, and its EcoBoost engines deliver solid miles per gallon. For example, the 1.6-liter can get up to 33 MPG highway, the best automatic HWY fuel economy rating in its segment. So, yes, take that trip you've been thinking about; drive your new Ford Escape from Phoenix to Los Angeles, or simply across town to the Musical Instrument Museum. The Escape is built for family and for fun - take advantage of it! Learn even more about the completely redesigned Escape, a 2013 IIHS Top Safety Pick, U.S. News & World Report's #1 Affordable Compact SUV and Popular Mechanics' first ever Car of the Year award winner! Scroll down to read Peoria Ford's full review of the 2013 Escape below. When comparing the 2013 Ford Escape alongside the 2013 Toyota RAV4, Subaru Forester and the Honda CR-V, and you'll find that the Escape out does those autos in oodles aspects. Catch a glimpse of just a few of the reasons below. Don't roam to a independent car repair shop in Phoenix when Peoria Ford's phenomenal Escape experts are only a brisk ride away from your household. We also provide a long-term warranty on our repairs - more than most independent shops do. Fords in Phoenix can take a pounding, so turn to the auto repair masters in Phoenix - Peoria Ford. Whether you need us to get a handle on a simple chore as an oil change, or take on challenging Ford service and repairs like transmission rebuilds, strut and shock repairs, timing belt replacements. Peoria Ford is your best bet in Phoenix for quick, professional Ford service and regularly scheduled maintenance. Save money on your next service appointment - click the link below to learn more. Did you know that this is the first year Popular Mechanics has given out a Car of the Year award? Yup, and the 2013 Ford Escape has won the inaugural title, on top of being one of the magazine's 2013 Automotive Excellence Award winners. That's quite an achievement. PM's editors honored the Escape with their first-ever Car of the Year title because it's "a capable hauler, and athletic driver, and an all-around great car." 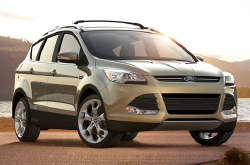 There are several reasons for SUV shoppers to purchase the redesigned 2013 Ford Escape in Phoenix. Safety is one of those reasons, especially for families. The Escape is an IIHS Top Safety Pick that offers many standard safety technologies, as well as several advanced optional security features. BLIS with cross-traffic alert is a noteworthy option; with this technology you won't have to worry about potentially hitting any objects in your blind spot ever again. Many of Peoria Ford's shoppers have also chosen this award-winning SUV because it's high-tech. Options like push button start and SYNC with MyFord Touch are huge hits, and these are only a couple of the amenities that are available to you. 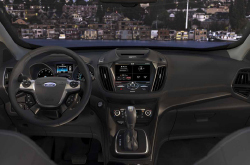 Find the Ford Escape at our Phoenix area dealership today to experience these features firsthand and learn even more about all of the technologies the Escape has to offer.